I already use certain keyboard keys to transfer information from the IGesture Pad to Windows applications, especially to Autohotkey, in order to trigger certain Windows actions by certain gestures. For example, I use the IGesture Pad to send "Pause" or "PrintScreen" keys when I carry out certain gestures on the pad, in order to trigger certain gesture audio feedback sounds in Windows, via Autohotkey. At the moment however, I sort of run out of spare keys (that are not really used in Windows) in order to trigger even more actions. 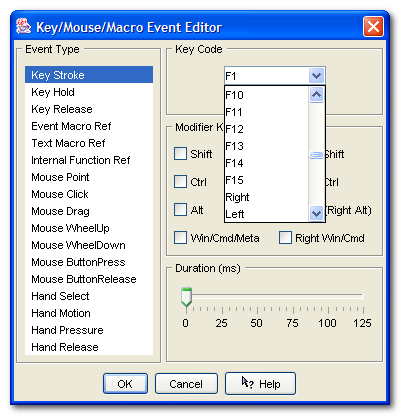 I tried F13, F14 and F15, which are all available in the Fingerworks Gesture Editor as possible actions on a gesture, and which are not physically available on my keyboard. However it seems that Windows doesn't recognize these keys for some reason (tested with the Autohotkey Spy which can show all physical and virtual keystrokes that are happening on the system). Therefore, if anyone has ideas for more keys that are a) usually not used in Windows, and that b) are available as possible actions in theFingerworks Gesture Editor, I'd be happy to know. Last edited by David.P on 11 Feb 2015, 18:20, edited 1 time in total. Hi David, if you run out of keys, you can work with key sequences. Hi Ivan and thanks for the reply. Is that the approach you are referring to? While I have not yet implemented this approach, I surely will do so because the current hotkeys that I am using (like PrintScreen and Pause) keep having side effects at times. Hi Ivan are you still there? ...then I first get x3F typed on the screen, then it is erased, and only then the sound is played. Therefore, I'm not sure whether using hotstrings like these will work for making the iGesture Pad do things via Autohotkey?